Hale Hamilton manufacturers a configurable range of Actuated Valve Modules for high pressure gas applications. The modules are based on our highly reliable ASV157&158 valves and are suitable for a range of applications. (this feature provides better leak tight integrity than equivalent hard seated valves, particularly in the presence of contamination). Visual indication of valve position. Flange connection system - lower fabriaction costs (less welding, pipe, pipe fittings, etc). On Valve instrumentation ports - further reduced piping and fabrication. 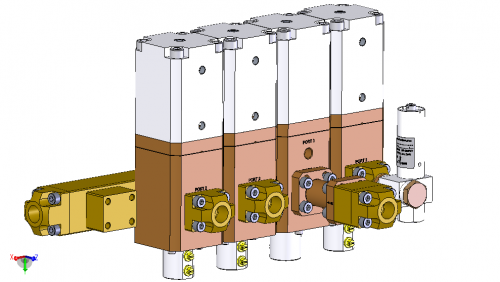 Instrumentation port of manifold as standard. Zero Clearance couplings for easy valve removal. 2-8 valves per manifold (typical). Manifolds can be bolted together to create longer valve manifolds. Inlet and Outlet Pipe Connections to suit customer requirements. Contact sales from more information.